Wedding traditions have been passed from generation to another, but they’ve all started somewhere, somehow. Before tying the knot, have fun discovering the origin of some rituals and lesser-known facts that Esposa has compiled; you’ll remember them with a smile on your big day! The white dress “trend” started with Queen Victoria back in 1840. Contrary to what many think, the Queen did not choose the color for its display of purity, rather for its connotation of wealth! Since the white color was impossible to clean, the wedding dress would be worn only once, a luxury not anyone could afford! Dating back to Roman times, the veil represented a symbol of purity. Although its symbolism changed over the years, it remains to date an elegant accessory that completes the wedding dress. Before flowers, women used to carry a bouquet of aromatic herbs and spices to chase evil spirits away. With the fading away of such superstitions, herbs were replaced by flowers, not only for their elegance, but also for their connotation of purity, and happiness. Hundreds of years ago, touching the bride’s wedding dress was thought to bring luck to one’s romance life. This invasive ritual was soon replaced by tossing the bridal bouquet into the crowd to distract the guests. Today, the gesture is mean to pass on the bridal’s good fortune to the single lady who catches the bouquet! It is said that rice is a sign of fertility and can help newlyweds have children. In ancient times, couples used to be showered by wheat, which was replaced by rice, also a symbol of fruitfulness and prosperity. Originally, the flower girl symbolized a bride-to-be’s last moments of innocence and a symbol of future motherhood. While flower girls used to carry wheat and herbs anciently, today they open the wedding ceremony by scattering flower petals down the aisle. Even though the bride and groom are not kept from seeing each other before the wedding day anymore, the superstition of bad fortune if the husband catches a glimpse of the wedding gown remains. The tradition is more likely meant to build up the excitement of the big moment when the bride reveals herself in her white dress to her future husband. 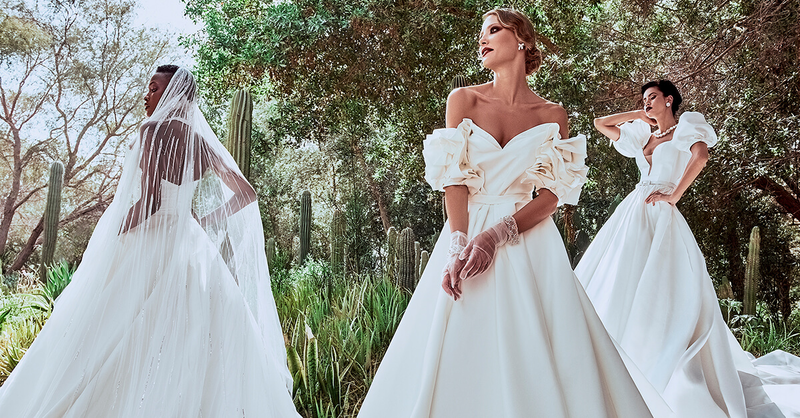 If you’re still looking for that perfect white dress, Esposa bridal boutiques have you covered with their wide multi-brand selection of wedding dresses, in addition to wedding shoes and accessories, to help you find your perfect wedding look!